"This change is not expected to have a material impact." EA has told its investors that removing microtransactions from Star Wars Battlefront II will not have "a material impact" on the game's projected earnings. Following intense community criticism, EA announced that it had temporarily suspended Star Wars Battlefront 2's premium currency, Crystals, ahead of the game's launch yesterday. The news was swiftly followed by a security report to its investors, which soughts to assaude fears that the suspension would impact earnings. 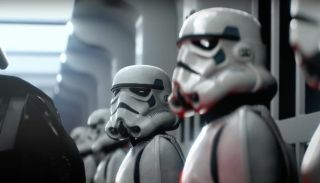 "On November 16, 2017, Electronic Arts Inc. (“EA”) announced in a blog on its website at www.ea.com/news that it will turn off all in-game purchases for the Star Wars Battlefront II title until further notice," said the statement, along with the original press release issued by EA's Jacob J. Schatz. "This change is not expected to have a material impact on EA’s fiscal year 2018 financial guidance." Electronic Arts has also announced it's changing the way progression works in Need for Speed Payback. "We've been using Community feedback, along with our own in-game data and have come up with a number of changes, many of which are in the process of going live," said an EA spokeperson. "Our aim with these changes is to make the progression, especially around the ownership of cars a much more enjoyable experience." We gave Star Wars Battlefront II 63 in our review, stating: " If the campaign's story were better and the progression system not so irritating, I might have really liked Battlefront 2."